176 pages | 1 B/W Illus. This book provides a methodological perspective on understanding the essential roles of econometric models in the theory and practice. Offering a comprehensive and comparative exposition of the accounts of models in both econometrics and philosophy of science, this work shows how econometrics and philosophy of science are interconnected while exploring the methodological insight of econometric modelling that can be added to modern philosophical thought. The notion of structure is thoroughly discussed throughout the book. The studies of the consumption function of Trygve Haavelmo, Richard Stone, Milton Friedman, David Hendry and Robert Lucas are taken as the case studies to investigate their methodological implications of model and structure. In addition to the semantic view of the scientific theories, various philosophical accounts concerning scientific models are used to shed light on the methodological nature of these consumption studies in economics. This book will be of great interest to scholars and students of methodology of economics and econometrics as well as anyone interested in the philosophy of science in an economic context. 'Chao contrasts the received and the semantic views of theory in economics and comes down clearly in favour of the latter. He illustrates his arguments with discussion of demand theory, the consumption function, and the so-called LSE approach to econometrics'. 'The semantic or model-based approach is a philosophical view about the nature and function of scientific theories which has become increasingly popular in the methodology of economics. Some scholars have recently argued that this approach is able to provide fundamental insights to understand the role played by econometric models in connecting theoretical claims with empirical evidence (Davis 2000; Stigum 2003; Chao 2005). 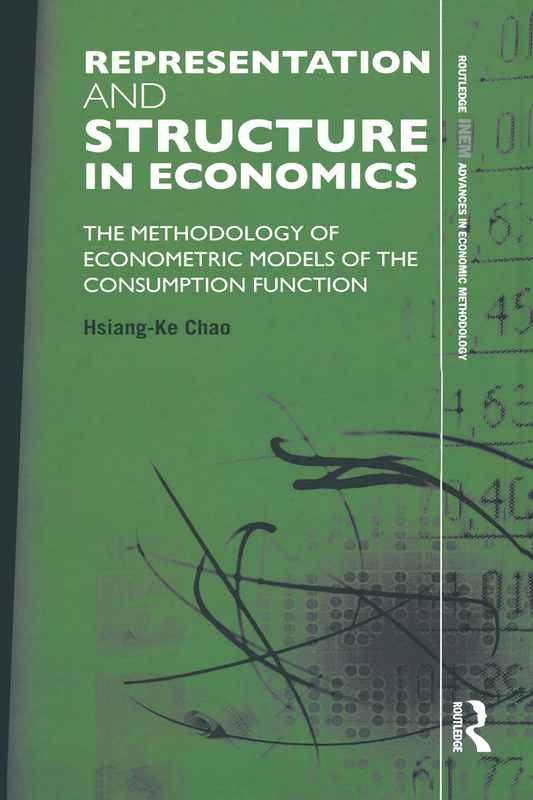 In his Representation and Structure in Economics, Hsiang-Ke Chao investigates further this issue by both offering a thorough discussion of the semantic approach and presenting accurate and illuminating case studies drawn from consumption studies'.